One of the hardest things about gardening with kids is that there is no real “immediate gratification” for their work. Plants take time. While it’s a great life lesson to learn, it can be a challenge. Sometimes, I like to give classes a quick win, and microgreens are perfect for just that. Microgreens are just the tender young shoots from certain plants. My favorite microgreens are black oil sunflower shoots. They’re nutty and interesting and pack a nutritional punch. Micro-cilantro is also delicious. I worked with a third grade class last week to plant pea shoots. I ordered field peas bred specifically for shoots from Johnny’s. After they arrived, I poured them into a clean bucket and let them soak in water for 24 hours before the girls were scheduled to plant. When the girls got to my classroom, they scooped a few shovels full of an organic potting soil into flat greenhouse trays, making sure that the soil was level and breaking up any clumps that they saw. 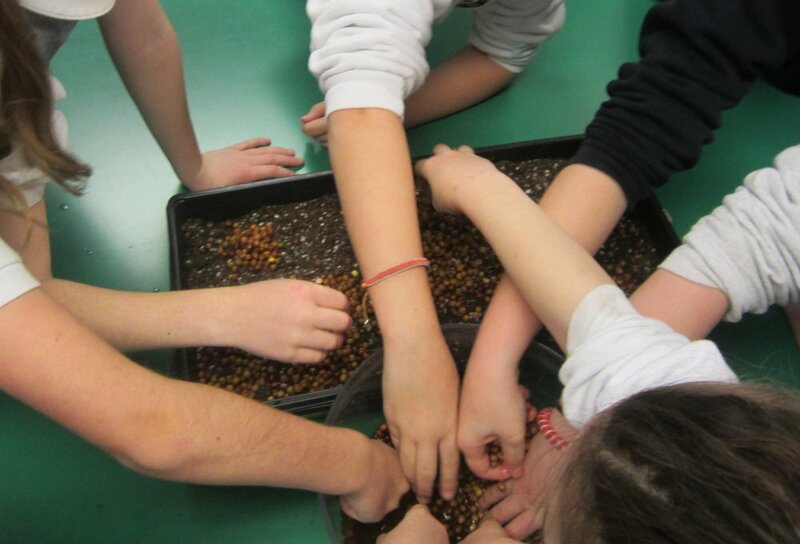 Finally, they took handfuls of soaked peas and spread them out in a thick layer over the soil. A week later, and voila! We have pea shoots. They taste bright and fresh, like someone injected the flavor of snap peas into a crisp spring lettuce. My favorite way to eat pea shoots (other than straight out of the trays) is with pasta. I mix the shoots into the pasta with shredded Parmesan cheese and lemon juice. I like to harvest them when they have several sets of open leaves. They weren’t quite there this morning, but spring break begins tomorrow, so I wanted the girls to have an opportunity to sample their hard work. They ate their pea shoots my favorite way… straight out of the tray. These kinds of projects are a great way to bring a little gardening indoors during the cold, winter months. (Or any time!) It’s also perfect for a classroom setting, because students can observe the growing process and quickly see the results, even if you don’t have access to an outdoor garden space. Have you ever tried microgreens? What are some of your favorites?